Mad Men Season 5 recap: Roger and Don's mother-in-law have a moment. Mad Men Season 5 recap: Roger and Don’s mother-in-law have a moment. Divorce has reawakened the mischievous boy in Roger Sterling. Sacre bleu! When I saw that “Adult Content and Situations” warning at the top of the episode, I figured we’d be treated to some hanky-panky before the hour was out. 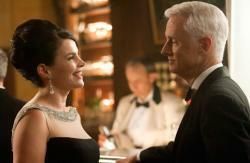 But Sally Draper walking in on her Québécoise step-grandmother (played by Julia Ormond, no less) fellating a freshly divorced Roger Sterling was one of those wildly unpredictable turns that would seem utterly implausible had the chain of preceding events not rendered it kind of inevitable. The peculiar clockwork of Mad Men. But the centerpiece of the episode was Megan’s deft success in saving the Heinz account. I found this whole sequence thrilling, notwithstanding the hokiness of the time-lapse idea itself. But did it strike either of you that Megan’s élan both as a creative and as a clever, manipulative accounts woman ended up being a big deal to everyone but Megan? Sure, she was flush with victory when she and Don got into the taxi after the transubstantiation of Sauternes into Champagne. But when Peggy delivered her (by now characteristically on-the-nose) speech about the satisfaction she takes in watching another woman break the glass ceiling, there seemed to be something ever so slightly dismissive in the way that Megan smiled, conveyed her thanks, and walked away. “This is as good as this job gets,” Peggy says. “Savor it.” But it’s clear that for Megan, anyway, that may not be enough. Emile scolds her about not doing what she “wants to do.” But what is that? What is the true calling that Megan deferred for a life on Madison Avenue? Acting? Apart from a few stray references—and an explanation, at the end of last season, that she couldn’t hack it in show business because she’s got a mouth full of teeth—that hasn’t seemed like a major preoccupation. Speaking of poor Peggy, it’s amazing to watch the contrast between the jocular confidence with which she carries herself at work and the tentative, slightly clueless, self-effacing way in which she approaches her social life. Joan is clearly not the person from whom Peggy should be taking cues in navigating the world of men, and I was touched by the way she made peace with her new reality after Abe turned the Champagne back into Sauternes at the Minetta. But then there was that terrible moment, after the ham dinner, when her mother delivers her account of the desolate hell of a life with cats, and Peggy says, choking back tears, “You want me to be alone?” In that moment, Peggy seems to concede that Abe might be just “using her for practice,” that this relationship doesn’t have real legs. Maybe she’s not that wild about Abe. But she’s settling, because this—this scenario, this guy—is the best that she thinks she’s going to do. Don’t get me wrong, I love Roger, but he can’t have all the fun. Favorite detail of the evening, apart from the fact that Ed Baxter was played by the guy who killed Laura Palmer: Everyone at the American Cancer Society dinner was smoking!